Bangkok is the city of smiles, as it claims, of spirit houses, hanging helaconia 10 feet long, canals and rivers for public transport jammed with floating water hyacinth (weeds), extreme moist heat, shocking pink taxis and electrical three wheel ones, magnificent shopping m alls where one floor alone the size of Wolfgate is dedicated to world famous jewelers and watch makers (like Cartier Piaget, etc. 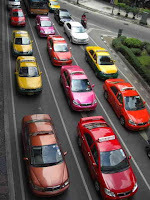 ), theatrical elephants you can feed sugar cane, admired royal family with their images on skyscrapers and, on Mondays, yellow polo shirts fans w ear each Monday in honor of the King’s birthday,(He was born on a Monday) and of all things Starbucks. Yea. I had my first frapaccino in two months and beside that, they took my Starbucks card. (they wouldn’t do that in Chile.) Heaven had descended on Bangkok. To go with this are massive traffic jams on super fine highways and byways, barges at least three stories high and dinner boats with colorful lights blaring Long Live the King passing in front of my very Thai styled villa - if you can see through the hanging plants, orchids, lotus blossoms and vines - and a public transit system that includes besides taxis and buses, a sky way train, a subway train and of course a boat of every size and description, including a taxi boat you catch depending on the color flag it carries: watch out jumping up onto the dock. It’s in a hurry. With all the orchids, the ginger flowers, the palms and holy Bodi trees wr apped in sashes and string, (Buddha was born under the Bodi tree - also from a lotus blossom, I’m confused), you are embracing a tropical paradise that’s a center of international business. There are skyscrapers for miles as the city spreads out in fingers surrounded by water. It is a Buddhist land, but completely different from the practices in Bhutan, India and Nepal. Here temples, and many houses have pointed tips on their roofs, looking like curved lightening rods and diving dragons, but they keep evil spirits from resting there. 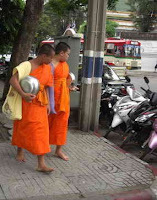 Monks wear orange and ochre and carry metal bowls as they stroll through markets and street fairs where they will be fed by merchants. Here also is great adoration for the King and Queen, who have as many if not more offering places than Buddha. 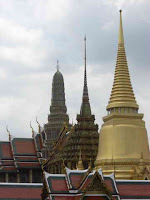 The Grand Palace and Temples with its Royal Monastery of the Emerald Buddha (really made of jade; the King personally changes Buddha’s gold attire each season) and the pure gold ship of state in another t emple on the grounds is something you have to see to believe. We missed the crystal Buddha - areas were roped off for the deceased Queen Mother who has been lying in state almost a year. There are so many abutting towers and cantilevered roofs, so much extraordinary ceramic and mosaic work and colored glass and gold, gold gold in the temples and rooms guarded by giant monster dogs who stand as people, that you forget about how hot and sweaty you are and that you need to sit down, which you do at a simple table and eat street food cooked on the spot. 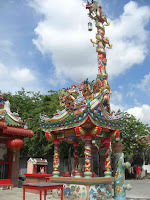 Even Chinese pagodas (red paper lamps, dragons all over the place, fu manchu type concrete statues, compete with other Buddhist stupas, chortens and displays of faith throughout the city. 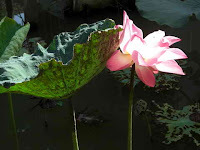 We stopped at one so I could light incense for my girls in prison, and take pictures, which they allowed. But then, the stupas to end all stupas are h ere like tall cones seen from miles around, highly embellished on the outside with repetitive marble and concrete figures colored in ceramic and glass mosaics. 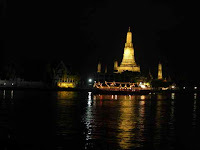 I climbed up steep stairs of the Wat Arun (Temple of Dawn) and took so many photos my battery died. Temples of gold allure and red roofs are everywhere including your own back yard. 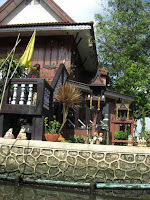 Along the canals, almost every little poor man’s house has a spirit house, highly ornate, about the size of a doll house, with strings of flowers and other offerings placed on it everyday, and statues of Buddha and whoever one calls to keep the bad away. These little spirit houses are residences for evil spirits, so they are precious. Keep the evil spirits outside the house by giving them a house of their own. Hmmm. Not a bad idea. Remember, Thailand is/was Siam. 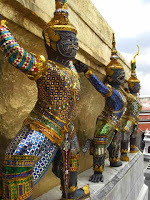 It is where the King of Siam or The King and I found roots. I kee p looking for green faced monsters in gold attire with crowns with turrets, but nowadays, that is confined to cultural shows. 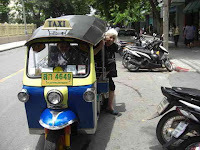 Most Thai are hip as anyone in America, in fashion, in flipflops, and in sun glasses. The young people dance in hip hop competitions at malls, and dress in blue and white uniforms for school. No more costumes, so to speak. It’s a fashion and fabric free-for-all. Teak houses still grace the canals and inside, if you are able to go inside one, are usually rooms with rims you have to step over to get in and out, and incredible wooden wood carvings of heritage scenes from history, and on display swords and thangkas of a different st yle, and of course enormous tangled gardens of the best of the tropics. Thai thangkas are scenes of a Thai-type Buddha ( he wears the gold pointed hat rising from his skull cap) with more landscape and small figures than the large apparitions of his many manifestations and companions found in Bhutan and Nepal thangkas. You can still buy giant gold buddhas on the sidewalk, but the paintings depict other aspects of life than his companions and saints. One of the most interesting outings was to a fish emporium, really a Las Vegas sized restaurant called "Sea Food: If it swims we have it." I’m surprised someone has not thought of this in America. You enter, are given a table with three or four servers, then you get a basket and stroll along a long long display of every kind of fish, fresh or frozen, and seafood known to man. Lobsters are bigger than my thighs. Fish are so fresh they are flipping in the air. 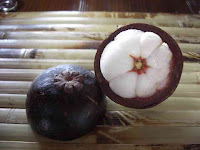 There are also displays of Thai vegetables, fresh, and exotic fresh fruits like the Dragon fruit, guavas, you name it, it was on the rack. Afterwards we took a dastardly taxi ride many miles to the other side of the city for the Siam Niramit, a stage production in an enormous entertainment center with a set claiming to be in the Guiness Book of World Records as the highest stage in the world. I don’t know about those details.It didn’t appear as high as Circus de Soliel stages. The production was elaborate and noisy and in the Thai language and it took viewers through Tai history with elaborate sets of boats floating on water, the Khmer stone castles, and Ayutthaya, once a capital city, There wer e war scenes, fiery hell scenes, mythological scenes in the Himapaan forest, and heavenly scenes with angels flying around on pulleys to reproduce Daow-wa-dueng, the second level of heaven where Indra, called the greatest diety of all, presides. It gave you a tip about the culture and heritage of the Thai people and their skill at theatrical production. But my favorite part was when the two elephant crossed in the aisle in front of me. Their trunks properly curled up in the air on cue. 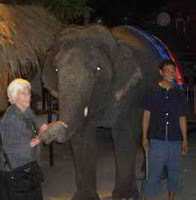 After the applause (it was not a full house), and we exited the enormous place, the elephants had been disrobed and I had the chance to feed one of them sugarcane chunks at 30 bhat for four sticks . The elephant was feeling my arm for more, more, but we had to give way to another. I have now bonded with elephants in Nepal, India and Thailand, where they are highly loved and respected. Sigh. 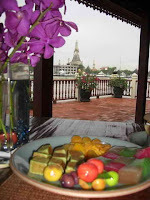 Photos: Temple of Dawn at night from villa; check the shocking pink taxis; various Stupa tops; a three wheeler; two monks admire motorcycles; lighting incense for the RA girls; Chinese pagoda entrance; a spirit house teak style; dog and monkey protectors on the Grand Palace walls; mangostien fruit; a plate of sweets; a lotus blossom; feeding a Bangkok elephant.